Gold continued to weaken During Friday's session after loosing a total of $15 in the prior two days as the greenback continued to gain strength. The US Treasury bond yields weighed on safe-havens and made it difficult for Gold to find demand. Additionally, major equity indexes in the US continue to float in the positive territory despite pulling back from session highs, reaffirming the risk-on mood. On the other hand, White House advisor Kudlow said that 'tremendous progress' was made on trade talks with China and added that President Trump and his counterpart Xi could sign a deal at Mar-a-lago. Meanwhile, the greenback continues to ignore the bearish data from the US and applying pressuring on the yellow metal. 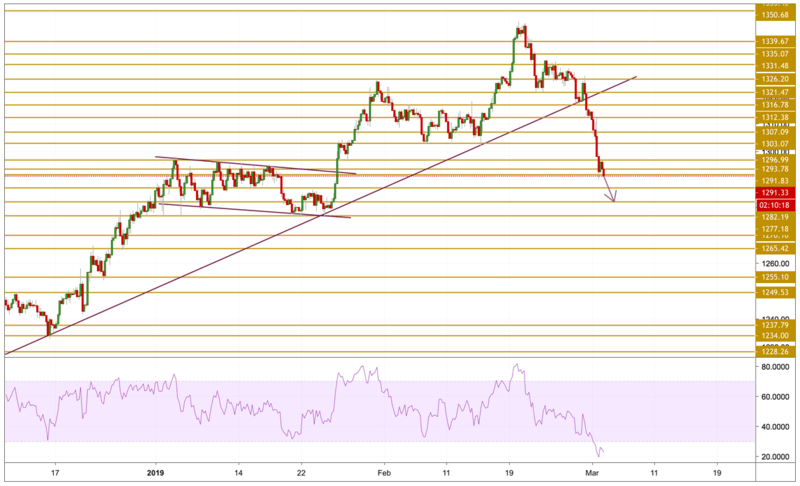 After breaking the key trend line presented on the chart to the downside, Gold prices added more than 2% to its devaluation to make it a total of 4% in 3 days. The price is currently retesting the lows ignoring the extreme oversold state. The momentum is still bearish and a correction seems yet to happen. We will be focusing on the $1282.19 key support level.